HAWKINS – A two vehicle accident in Wood County over the weekend left one person dead and one injured. It occurred just before 10:45 Saturday morning on Farm Road 14, just over 2 miles north of Hawkins. 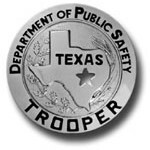 Steven Joseph Almanza, 28, of Dallas, died in a Tyler hospital. His passenger, Jenny Paine, 31, of Dallas, is in serious condition in a Tyler hospital. The Department of Public Safety says the accident happened when a pickup driven by Emily Catherine Moore, 17, of Hawkins, hydroplaned and crossed the road and hit Almanza’s SUV. Moore was treated and released at a Tyler hospital. The crash remains under investigation.